Buyers flock to greener cars | What Car? Two-thirds of prospective new car buyers will be looking to buy a greener vehicle in the next 12 months, according to a What Car? survey. However, 47% of purchasers say they will be buying a greener car for financial reasons, while only 19% say environmental issues are the main factors for their next car. Steve Fowler, What Car? group editor, said: 'The Government will be pleased with this news coming so soon after Alistair Darling's Budget. Last month, Chancellor Alistair Darling announced a number of measures in his first Budget to encourage motorists to buy more environmentally friendly cars. These measures included new Vehicle Excise Duty (road tax) bands that will come into force in 2009, which will make buyers of more polluting cars pay more road tax. Also, in 2010, the Government will introduce a so-called 'showroom tax' where buyers of the most polluting cars will pay a new, higher rate of tax in the first year of ownership, while new cars with carbon dioxide emissions of less than 130g/km will not pay any road tax in the first year. For tips on greener driving, follow our advice below. 1. 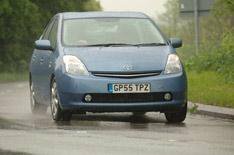 Driving at 60mph uses up to 9% less fuel than at 70mph. Also, if you've got cruise control, use it - maintaining a steady speed is more fuel-efficient. 2. Keep weight down. Ensure your car is as free of clutter as possible, and remove roof racks and bicycle racks when not in use. Their weight and aerodynamic drag increase fuel consumption. 3. Plan your journey and use a satellite-navigation system or internet route-planning sites before you set off. Getting lost or stuck in traffic pumps additional carbon dioxide into the atmosphere. 4. Travel outside of rush hour to avoid congestion. 5. Try not to use all of your car's electrical systems at once - they all give the alternator more work to do, which in turn makes the engine work harder, contributing to your vehicle's carbon dioxide output. 6. Read the road ahead - keep your distance from the traffic in front so you don't have to brake and accelerate every time it slows down and speeds up. 7. Turn engines off when stuck in traffic or when waiting for passengers to arrive. 8. Consider offsetting your emissions - look at websites such as (http:// www.climatecare.org)www.climatecare.org that can help calculate your CO2 output. 9. Look at car sharing - set up a system at your place of work or start a car-sharing school-run.